Come and join us in North Devon for the Paintball session of your life. 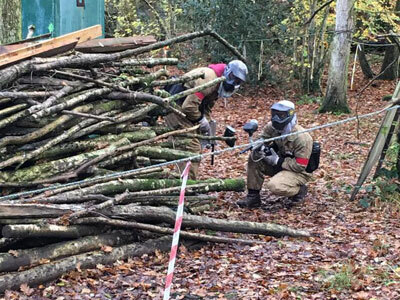 You will not find a paintball site to match – based in twenty acres of woodland, is a truly awesome games arena which everyone can enjoy. With eight woodland playing areas featuring bridges, trenches, barricades, pig pens and even a satellite station you will have plenty to explore in combat. Whatever your groups age, experience or fitness level there is a series of games to suit your needs and guarantee a fun and memorable time. 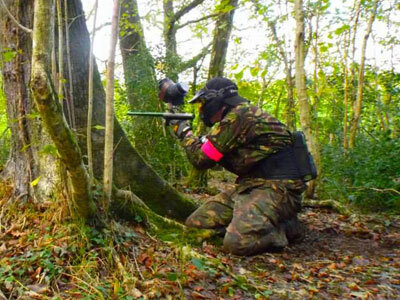 We have carefully selected one of the best Paintballing sites in the whole of Devon. There are many challenges and scenarios on offer for your Stag do. The site in North Devon offers eight woodland playing areas featuring varied terrain and landmarks including a church, bridges, trenches, barricades, war pill boxes, towers, missile complex and even a satellite station so you will have plenty to explore in combat. We know that Stags come in all shapes, sizes and ages and we cater for them all. No matter what the age of your group, experience or level of fitness then this paintball challenge will be tailored to suit your needs, with a series of games guaranteed to give you a fun and memorable time. If you like the Paintballing then you might also like…. We know that all stag do’s aren’t the same, so you can add to Paintballing to get your ideal combination. In addition to your organising single activities we can also arrange transport, food throughout the day, restaurants for the evening, clubs and accommodation, we’ve sourced suppliers across North Devon. Just let us know any extra requirements when you contact us. Or check out our packages to see some of the carefully selected stags days and stag weekends we have put together.